Just been finishing off the Sintoma Skateboards... one more to go!! and finishing off the Midnight Woolf record!!! hahaha it's gonna be a laugh! 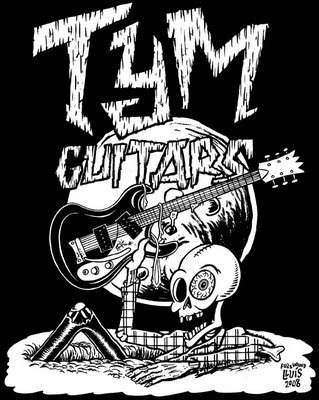 meanwhile here's a T-shirt design I did for Tym Guitars... the best guitar shop in Austalia I say!!! he's in Brisbane, we went up there for a wild weekend a few months ago, and Tim lent us guitars and stuff and made us feel at home...such a cool NEW shop!! gotta do it again soon! I just got a T-shirt from him and the Silk Screening turned out really good... so if you would like one just go HERE and order one in.